It’s tempting to say it all started with Imelda Marcos. But that’s not quite true – it started with a group of businessmen with a connection to the Philippine first lady. About a quarter-century ago, Rotary International, a service club that now has 1.2 million members worldwide, decided that instead of only hosting lunches or building tennis courts, it wanted to take on a more serious, global challenge. One of their members thought about polio: The disease had once made hundreds of thousands of people sick, leaving them paralyzed or breathing through horrifying “iron lungs,” and in many cases eventually killing them. But vaccinations changed all that – for those who could get them. The Rotarians decided that they could get help to more people, using their massive volunteer power. They persuaded Ms. Marcos (who knew the wife of one of their members) to back mass immunizations and set to work. Within a few years, her country was polio-free. The group still was not satisfied, however. So they did something even more audacious: They created a partnership between a private network of volunteers and a public health initiative. 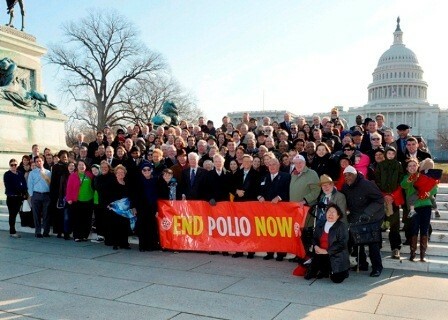 It was audacious because, back in 1988, world health officials pledged to eradicate polio. When the Rotarians first approached the World Health Organization to be a hands-on partner, they got the cold shoulder. The Rotary’s partnership was not just about raising money, though, although it has done that in spades – $1.2-billion (U.S.) so far. As Bruce Aylward, another Canadian physician and the assistant director-general of polio eradication and emergencies for WHO, explains, the organization also contributed through passion and focus. “They brought a single-mindedness, continuity, diligence and generosity that has helped keep the whole initiative on track,” he says. So much so that an end to the disease may actually be in sight – one estimate puts the timing at just 16 months away. Certainly, the numbers so far are impressive: Billions of children have been vaccinated; the record is 175 million in two days in India. Last year, there were only 223 reported cases of polio. But Dr. Scott is not resting on his laurels. In developed countries, there is ongoing tension between health officials and parents who do not believe in vaccinations. And there are still countries elsewhere in the world at great risk, putting “the virus only a plane ride away,” he says. Violence also keeps many volunteers from doing public work. “There are huge areas in northern Pakistan we are not able to reach,” he says. “Côte d’lvoire has just experienced a conflict and people are still cautious. They don’t want to open their door to just anyone,” says Richmond-Ahoua. But once they see the polio T-shirts and hats that Rotary clubs supply to identify vaccinators, she says they feel safe opening their doors. Communication is also key to mobilizing public support. Rotary members use the media, television, radio, and even griots, African tribal storytellers, to encourage participation in immunizations. As a result, 7.5 million children received two drops of oral polio vaccine, along with vitamin A supplements and de-worming tablets, during the NIDs.